how to make almond butter. here's to never purchasing expensive nut butters agaaaain! i love me some almond butter, but do not love the price tag at the grocery store. if you have a good food processor, you can easily make this at home for substantially less than the price you'd pay in store. can i get an aaaaaamen to aaaaaalmond butter aaaaaat home. i have a small little baby food processor that i use for simple sauces and breakfast bar type things, but grinding up a bunch of whole raw almonds........you gunna need a big BOSS of a food processor for this task. my parents got me this cuisinart one for my birthday, and it is great. i would not dream of making nut butter in the small food processor is what i'm saying. seriously, its like blending rocks. first, you're going to want to roast the almonds in the oven for about 15 minutes at a low temp - about 275 degrees. warming the almonds helps to kinda wake em up and get their natural oils ready for takeoff. this step also smells delightful...i have yet to see a roasted almond scented candle, but there should be one. for the first 5 minutes of running the food processor, the almonds will look grainy and dry. just keep scraping down the sides of the bowl with a spatula every couple of minutes and run it again. after about 10 minutes of this routine, your kitchen will probably be earthquaking like mad, your machine smoking, and you will fully expect the food processor to just rocket off into outer space at any moment. honestly, there were a few seconds when i couldn't tell the difference between the steam from the hot almonds releasing or whether the food processor was starting to ignite and was about to burst into flames. luckily, 'twas the former. don't give up now! that part is a bit scary/loud/seemingly dangerous and you will doubt your intentions for ever trying to make this because you think the room is about to be covered in almond dust and cuisinart shrapnel. but then, a magical thing happens. almond butter forms! just a few more minutes in the food processor and its mission accomplished. at this point, feel free to add a little bit of salt and pulse it into the mixture. i could have done without, but i added just about a teaspoon of salt this time. TA DAAAAAAAAAAAAAAAAA! 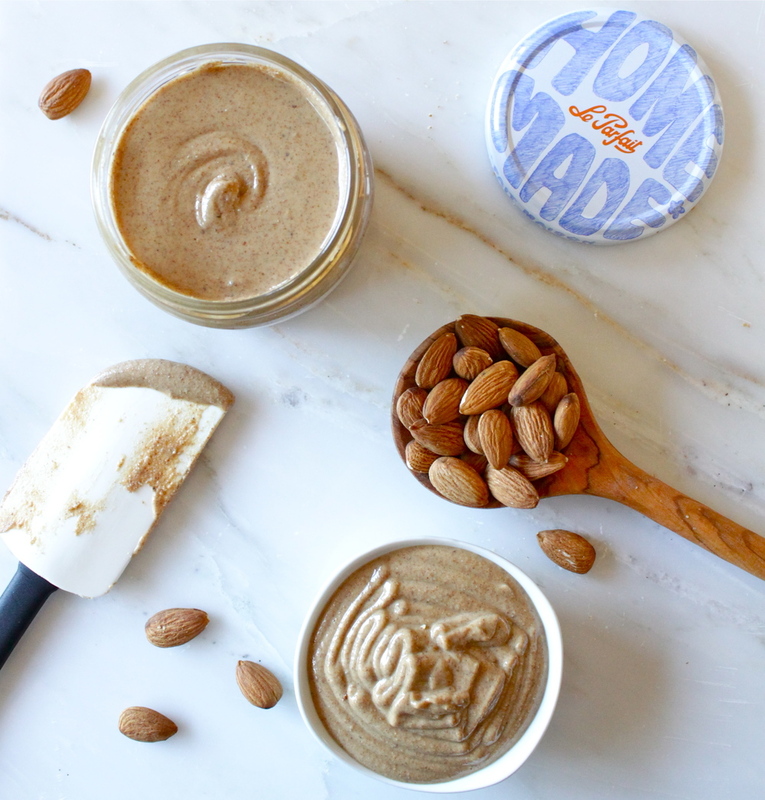 you're the proud maker of fresh, creamy almond butter. for cheap(er), i might add! pete and i calculated that this batch (more than one pound) of almond butter cost me $3 to make myself. we buy whole almonds at costco, and a 9 lb bag is probably around $10...la dee daa, carry the 1, we say $3. and that is super exciting since i generally drag my feet and snarl my way up to the trader joe's cash register with my some $7 jar of almond butter. those days are gone. sorry teej. Preheat oven to 275 degrees F. Spread 3 cups of whole almonds onto a walled baking sheet. Roast almonds in the oven for about 15-20 minutes. They will begin to smell oaty/like cookie dough/like holidays/marzipan. It smells warm & delicious. The roasting will help immensely with the speed of the nut butter making process. 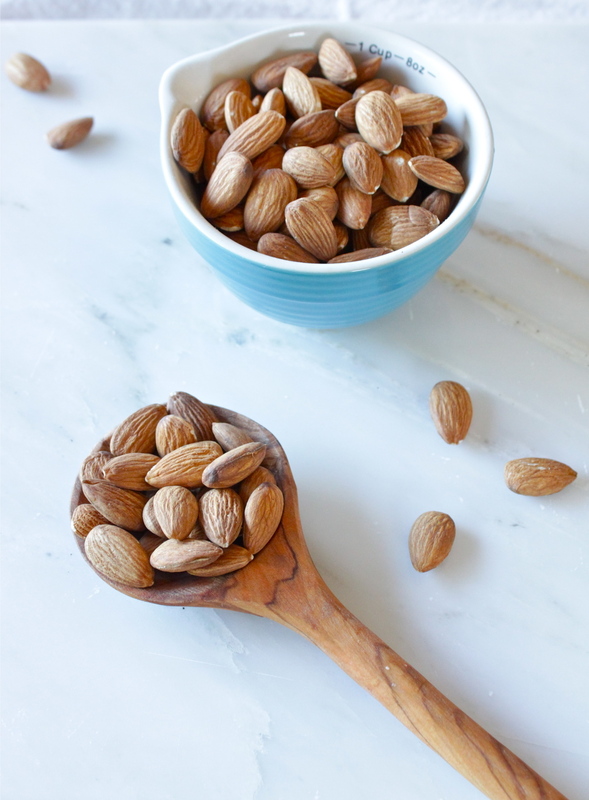 Remove almonds from oven and carefully transfer them to a large food processor. Run food processor on high for a few minutes until almonds are grainy. From here, run the food processor on high and scrape down the sides of the bowl with a spatula every 1-2 minutes. After about 10 to 15 minutes (depending on the quality of food processor) of running the processor and scraping down the sides, the almonds will begin to come together as a soft solid and resemble dough or clay. This is when you know you're close! Continuing to use the spatula to scrape down the sides of the food processor, run it on low until the nut butter has completely smoothed out and is creamy and smooth and no large chunks of almond grains remain in the food processor. Add 1/2 to 1 teaspoon of salt if desired and pulse a few times until incorporated. Transfer the almond butter to a jar and store in the refrigerator. Give the nut butter a stir if the oils have separated a bit. Enjoy on toast, in smoothies, on pancakes, waffles, crepes, on fruit, sandwiches, ice cream, etc, etc. !